Thanks to Sarasota County Commission action this week — and an anticipated Sarasota City Commission vote — completion of long-sought improvements to Myrtle Street in north Sarasota moved yet another step forward. On the recommendation of the planning manager for the Sarasota-Manatee Metropolitan Planning Organization (MPO), the County Commission voted 4-0 to rank the project No. 6 on its 2018 priority list for Florida Department of Transportation (FDOT) funding. That list will go to the MPO board for its approval before it is forwarded to FDOT, Leigh Holt, the MPO planning manager, told the county commissioners on Feb. 27. However, the earliest any of the projects would make it onto an FDOT programming list would be July 1, 2019, she explained. Additionally, on Feb. 27, the County Commission approved an increase in funding for consultant Kimley-Horn and Associates of Sarasota to undertake additional design and construction services work for the improvements on Myrtle Street from Central Avenue to U.S. 301. The county’s expense will rise from $527,116 to $868,346 for that initiative, thanks to the board’s unanimous approval of its Consent Agenda of routine business items. She was referring to the property owned by the Seminole Gulf Railway, which county and City of Sarasota staff members have been working for years to acquire. It has been that way for decades, he stressed. About two weeks ago, Moran continued, he had the opportunity to meet with City of Sarasota and county staff — as well as City Commissioner Willie Shaw — to talk about the situation. It was “incredibly helpful” to him to be able to sit down with all of those people, Moran continued. That enabled him, Moran said, to be sure “I wasn’t dealing with any personalities” or historical problems that had impeded a solution. 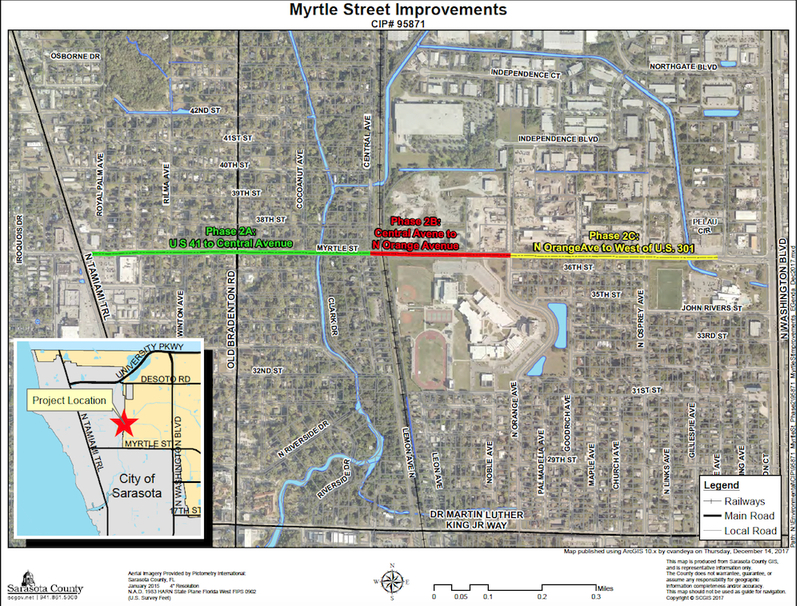 The City Commission is scheduled to vote soon on its 2018 MPO priority list, Wiggins noted, and the recommendation is for the city to put the Myrtle Street project on its list of priorities, as well. Commissioner Charles Hines thanked Moran for his efforts. 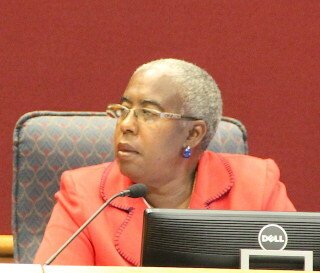 When Commissioner Carolyn Mason represented District 1, Hines said — before she had to step down in 2016 as a result of term limits — she tried “for years and years and years” to get the Myrtle Street improvements done. Mason complained that the railroad company’s demands were the reason negotiations had failed thus far. 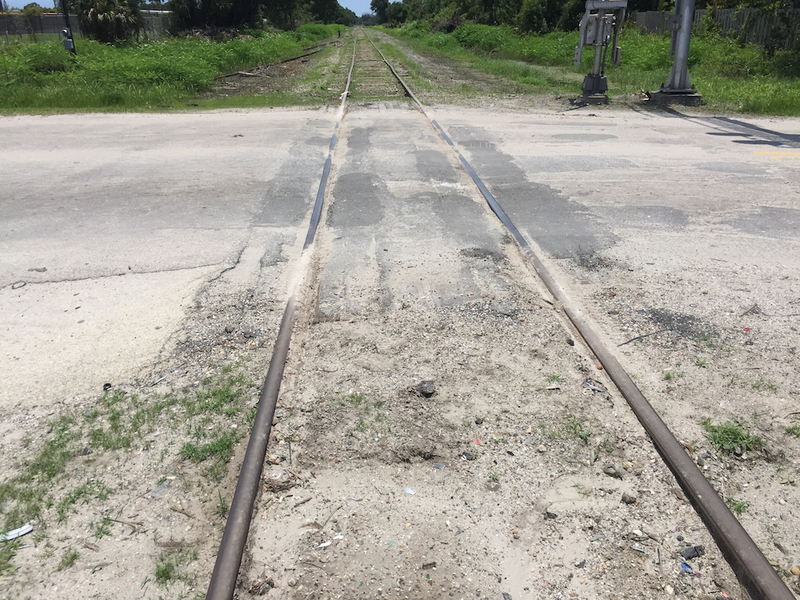 As recently as June 2016, an attorney for the Seminole Gulf Railway acknowledged the desire of city and county leaders to improve the crossing. However, in an interview with The Sarasota News Leader, Brian Patchen of Miami Lakes said company leaders at that time were unhappy with the prospect that the county might use eminent domain to acquire the property. Commissioner Alan Maio was absent from the discussion, as he was representing the commission at a board meeting of the Southwest Florida Water Management District. Phase 2A: U.S. 41 to Central Avenue. Phase 2B: Central Avenue to Orange Avenue. Phase 2C: Orange Avenue to west of U.S. 301. The memo adds that Phase 2A from U.S. 41 to Central Avenue, west of the Seminole Gulf Railway crossing, was to be constructed in two segments. The first, completed in 2016 on the southern right of way of Myrtle Street, entailed sidewalk, lighting, pedestrian bridge and drainage improvements up to the bridge over Whitaker Bayou. The second segment — on the north side of Myrtle from U.S. 41 to Central — “is not funded for construction,” the memo notes. 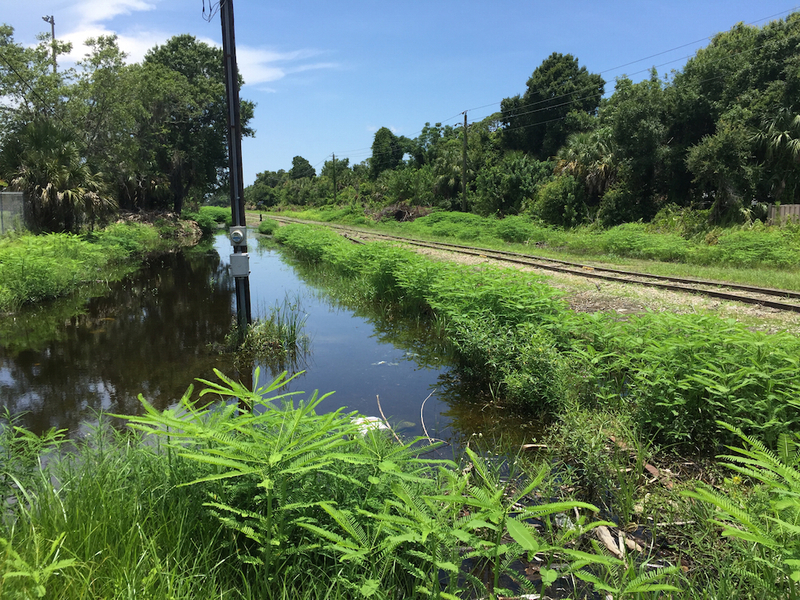 The railway “recently purchased the property intended for use as the stormwater management facility on the project,” the memo explains. That necessitated the relocation of the proposed pond site and the re-evaluation of the stormwater collection system in the area from the railroad crossing to the end of the project, the memo says. The extra $341,230 the County Commission approved for Kimley-Horn and Associates this week will cover that work, the memo explains, along with the firm’s revising facets of the Phase 2B work to reflect the completion of Phase 2A. The cost estimate for Phase 2B is $4.6 million, the memo notes, including $2.6 million for the railroad crossing replacement. Phase 2C, the memo continues, involves assistance from FDOT. The construction — expected to cost $2.4 million — is fully funded and anticipated to start in 2019, the memo adds. A public meeting was conducted on Feb. 6 to allow residents in the communities along the Myrtle Street corridor to review the design plans, the memo points out. Funding for the Kimley-Horn work will come out of county gas tax revenue and from a Community Development Block Grant fund the county uses for capital projects, the memo says.